Monsanto Sprouts Rising Revenues, But Can It Germinate More Growth? With corn and soybean prices trending lower, one concern on investors' minds is Monsanto's ability to execute its plan to expand profit margins through price increases. When Monsanto (NYSE:MON) reported revenues of $14.8 billion in its fiscal 2013, it marked the fourth straight year of sales growth, which was not a surprise given the number of corn acres planted in the spring. What is surprising is the company's belief that it can continue the strong growth by raising prices despite the state of the agricultural industry. Competitor DuPont (NYSE:DD) grew its agricultural revenues 11% during the first half of 2013, due to a 6% price hike and a rise in volume. A look at the year in its entirety shows a company highly dependent on revenues from its corn seed and traits business. 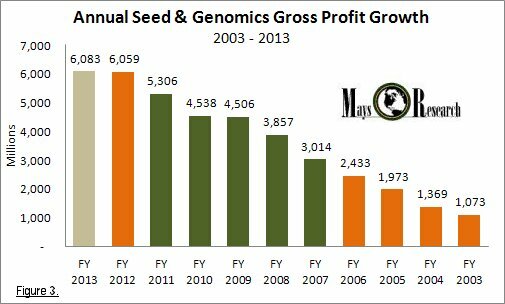 2013 seed and genomics revenues of $10.3 billion are 5.6% higher than a year ago. Corn seed and traits have always represented the lion's share of the segment's revenues. It was 64% of total seed and genomics revenues in 2013. However, last year it was the only seed business showing any material year-over-year growth. Monsanto's second largest seed business, soybean seed and traits, tumbled in the company's fiscal 2013, with sales falling nearly 7%. The company should see some improvement in this area as the company moves from zero soybean acres to a potential 100 million acres in Latin America. Before investors get too excited about 100 million acres, the company expects about 3 million acres planted with its Intacta soybeans, making it the company's largest soybean trait launch ever. This is on top of its 10 year, $1.75 billion licensing agreement with DuPont's Pioneer seed brand. Monsanto will book revenues from the DuPont annual licensing agreement during the company's fiscal second and fourth quarters. 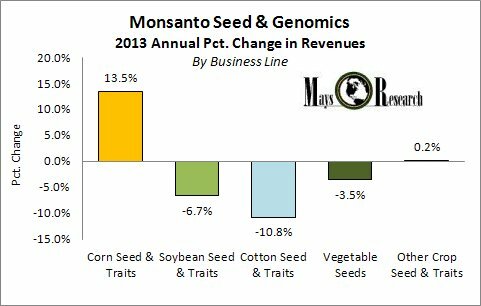 Despite the mixed year-over-year sales growth in fiscal 2013, Monsanto's seed and genomics business has delivered consistent revenue growth since the company changed to a fiscal year ending August 31, which more than coincidentally aligns with the corn and soybean marketing years. 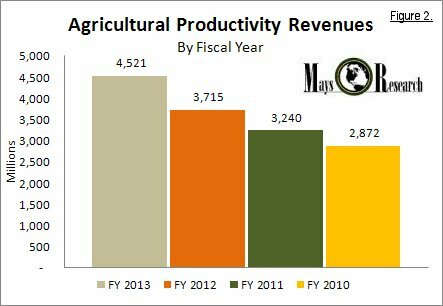 With revenues of $4.5 billion in the company's fiscal 2013, the agricultural productivity business has also grown for four straight years and at an average annual rate of 12% over that period. This segment's revenues peaked in 2008 when the company had net sales of nearly $5 billion so there is still some room to run before it breaks any new sales records. This segment manufacturers roundup ready and other herbicides for agricultural, industrial, ornamental, turf, and residential lawn and garden applications. Scotts Miracle-Gro (NYSE:SMG), which markets the residential version of Roundup Ready, reported that roundup sales have done particularly well since the company's fiscal 2012. Between June and August 2012 sales of the popular weed killer posted 20% gains amid high levels of rainfall this year in much of the US, which encouraged weed growth. With corn and soybean prices trending lower, one concern on investors' minds is Monsanto's ability to execute its plan to expand profit margins through price increases. Farmers want to maximize their margins as well and will have to decide if the yield increases and plant protection features the new seeds offer offset the additional cost. The company expects to grow earnings in the mid-teens in fiscal 2014. With falling crop prices, these are growth estimates that may or may not sprout earnings. G C Mays currently covers agricultural chemicals companies, wheat, corn, and soybean markets as well as the global macro economy. He has more than 20 years equity research and trading experience. He is expert at financial statement and data analysis.